A life-size diorama showing Saint Auguste Chapdelaine is on display in a tourist area in Guangxi. It shows the martyr kneeling before the magistrate who sentenced him to death. A six-metre bronze mural shows the cage in which he suffocated to death. A poetry contest gives prize money to those who praise “iron-willed” magistrate Zhang. 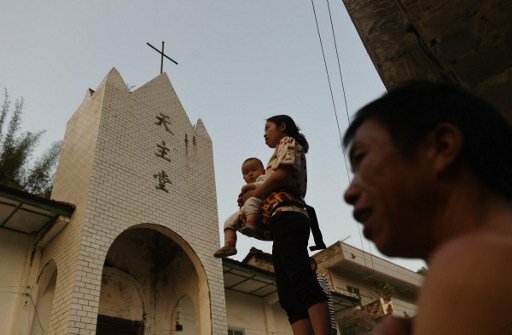 Beijing (AsiaNews) – Village authorities in Dingan, Guangxi, plan to celebrate the expulsion of Catholic foreigners from their area by opening a museum to celebrate Zhang Mingfeng, a magistrate from the Qing era who sentenced a missionary saint to death. The celebration includes a poetry contest. The new facility includes a six metre bronze mural showing the missionary confined in a cage. The region is a major tourist area and local officials want "to show the evil brought by those foreign devils" and condemn the "spiritual opium" that stifles people. The Maoist revolution developed against China’s repressive imperial system, but Maoist anti-religious propaganda has always followed the same crude narrative as the Qing era. Now Communist leaders in Dingan want to turn into a hero one of champions of that system that Maoism called corrupt. A poetry contest was mounted offering a thousand yuan for the best couplets praising the “iron-willed” judge who presided the trial against Saint Auguste Chapdelaine. Born on 16 January 1814 in La Rochelle (France), Auguste Chapdelaine was ordained priest in 1843. In 1851 he joined the Institute of Foreign Missions of Paris and on 29 April 1852 left Antwerp for the Chinese mission of Kuang-Si (old transliteration for Guangxi). In 1855, he began his apostolate, which led to 200 conversions in a short period of time. His work, however, created envy and jealousy. According to the chronicles of the time, a certain Pé-San, a man of corrupt morals, having learnt that a woman he had seduced had converted to Christianity, denounced the presence of the missionary to the magistrate of Sy- Lin-Hien, an arch-enemy of Christians, accusing the clergyman of stirring up the people and fomenting unrest. The “heroic” magistrate in question, Zhang Mingfeng, sent guards to Yan-Chan to arrest Fr Chapdelaine; however, the latter, forewarned, had fled to the house of a Christian writer in Sy-Lin-Hien. On 25 February 1856, guards surrounded and searched the house. Fr Chapdelaine, four other Christians, and the host’s second son were arrested. Overall some 25 people were taken into custody, beaten with bamboo sticks, chained and collared. On 26 February, the missionary was questioned and accused, whipped hundreds of times with a bamboo stick that left welts all over his body. The next day he was chained by his knees, bent over iron bars band until the 28th, waiting for Christians to pay a ransom. He was sentenced to die in a cage. On 29 February 1856, his neck in a hole in the top cover, he was hung, and suffocated to death. Beatified on 27 May 1900 by Pope Leo XIII, he was proclaimed saint on 1 October 2000 by Pope John Paul II. The decision to canonise the missionary – along with many other saints of evangelisation in China – sparked controversy in China. An article in Xinhua in September 2000, titled ‘Unmasking the so-called saints’, showcased the alleged crimes of three missionaries Qing era without any supporting sources. The three were Fr Chapdelaine, Saint Alberico Crescitelli, of the Pontifical Institute for Foreign Missions, and Spanish Dominican Francisco Fernandez de Capillas. The Dingan museum is not just a nationalist tourist facility, but fits with the government’s drive to sinicise religious activities in the country.